I am really happy with the way these lego cards turned out. They are my version of a few I have seen on Pinterest. I must say though, they are very tedious as I sponged all of those 1/2″ circles! 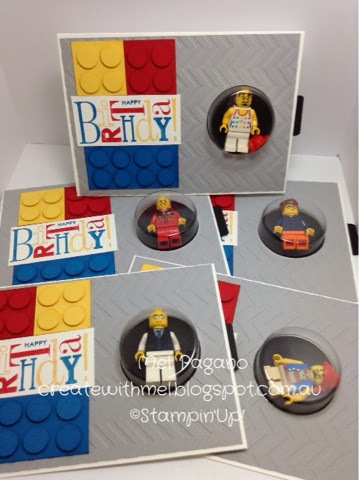 I would have loved to do a girl version, but apparently the ‘friends’ lego are slightly bigger than the figures used and don’t fit into the clear cups…so I am thinking of a girl version using a necklace or similar…what do you think? I have made these ones for the market night that I have at the end of this month. It will be interesting to see if they are popular! « Cutest Card in a Box Ever! Hi Mel, Just love these. It is my son's birthday next week & this would be perfect for him, just don't have time to make one! How much do you sell them for at your market? Thanks Tricia 🙂 I am planning on selling them for $7 factoring in the little lego man. Just wish I could do a girl version…maybe with a little necklace or something.